The natural forests used to be the only source of commercial timber in tropical timber producing countries. In the past several years however, governments have begun implementing strict conservation policies, which have curtailed the harvest levels from this fast depleting resource base. To meet their respective wood requirements and at the same time revegetate denuded areas, most tropical countries have started to embark in tree plantation programs. As in any endeavor, there is a felt need to improve on the various aspects, e.g., technical and implementing policies on the existing tree plantation programs in the Asia Pacific Region in order to ensure success. It is within this context that the Philippine Government held the International Conference on Timber Plantation Development on 7 - 9 November 2000 in Manila, Philippines. 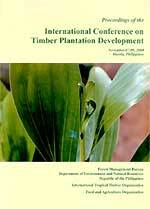 The Conference was organized by the Forest Management Bureau of the Philippines' Department of Environment and Natural Resources with the assistance from the International Tropical Timber Organization (ITTO) and in cooperation with the Food and Agriculture Organization (FAO) of the United Nations. Al-Rashid H. Ishmael, Al Hadj.